1 Put a splash of oil in a wok or frying pan. Add the vegetables and gently simmer until just soft. Add the chicken and then the tikka sauce and carry on cooking until it is piping hot and really soft. 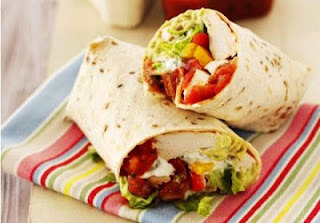 2.Place the mixture on top of the wrap and fold OR slice the pitta bread and place the mixture in that.